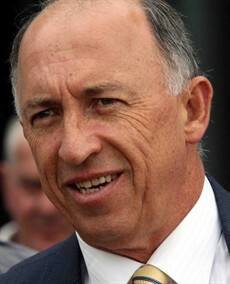 Robert Heathcote is the leading racehorse trainer in Brisbane. 'Rob's Shout' - the personal blog of the multi-premiership and Group 1 winning trainer appears exclusively on HRO. The Winter Carnival is now in full swing and my stable had a mixed day last week. We kicked the day off with a double and then a very strong fourth in the three-year-old stakes race only to be disappointed with Buffering’s performance in the Group 1 BTC Cup. I knew we were in a bit of trouble with Buffering when not only was he slow away, but he seemed to take an eternity to muster speed and he never found his smooth, fast front-running rhythm that we know he has. His jockey Damian said he didn’t give his customary kick at the top of the straight either. His effort was still full of courage and determination to still run a solid third but it’s concerning to me that he’s ‘off his game’ a bit as we head towards the Doomben 10,000 and possibly the Stradbroke. It’s conceivable that the horse raced flat because of the tough run he had in Sydney in the TJ Smith on the heavy track! The vet did find he was out in the poll which made him very uncomfortable until the vet corrected him with chiropractic manipulation. Maybe that explained his run, maybe not? 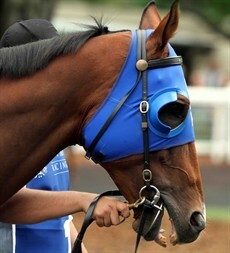 I won’t be changing a lot with Buffering’s work going into the 1350 classic next week! His blood work says he is fine and his work attitude is good. I have confidence that the little champ can bounce back to his best … hopeful anyway! 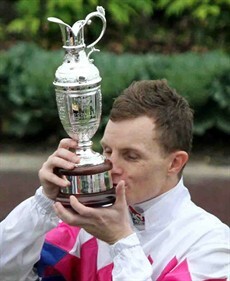 A huge congratulations to Ryan Wiggins for his first Group 1 win. Ryan has long been one of Brisbane’s hardest working jockeys and he is proof that perseverance will eventually pay off. It will certainly lead to further opportunities. Ryan won for us on Magic In Motion, the first leg of his treble. Ryan has a good record on Magic In Motion with two wins from two rides. Ryan felt he was held up on the mare up the straight which added merit to her win off a slow tempo. I liked the fact that she was came from behind as I love to see horses ridden a touch cold and come with a good strong late run as Ryan did with the mare here. Magic In Motion has had plenty of bad luck this past year with a few issues so very satisfying to see her get back into the winners stall. Bewhatyouwannabe was arguably unlucky at his previous start. The young apprentice erred in taking the horse back too far from a good gate in what was a slowly run race but he ran right through the line for an impressive fifth placing which put the writing on the wall for a strong showing last Saturday. The ‘smarties’ worked it out with Bewahtyouwannabe going around very well backed! Colless on top from gate 1, he was always going to get the gun run and Glen delivered. Looking ahead to this week with the Group 1 Doomben Cup being the showpiece race … unfortunately with no representations from the local trainers. The locals had a good day out on the first day of the carnival though, so hopefully that will/can continue. Some very tough races though and none tougher than the Fred Best two –year-old race. Gee, Hucklebuck, Dothraki, Safeguard, Enquare, Havana, Intothered and Hopfgarten and Palmera Lad. Wow, if this isn’t the best bunch of three-year-olds lining up then I’m Manny Pacquiao! That I am most certainly not! My little ‘nugget’ Hopfgarten is going for five-in-a –row, but the 1350 will be too slick for him. His goal is the 1400 Guineas on the bigger Eagle Farm a couple of weeks later. It certainly is a cracking race. The BRC sprint at Group 3 level is another good race on the card. Three of my stable stalwarts are lining up. Fifi, Fillydelphia and old Solzhie. The old bugger has not only been burdened with the 61 kilos but he’s now coming out of gate 16 or so. Ah well, just be nice to see him running through the line as the plan is to back him up in the 10,000 the following week. It sure does look to be a great days racing so fingers crossed we can enjoy some luck and a bit of the spoils.